Photos from the first Khaita supervision/exam, March 2016 at Dzamling Gar, taken by Enrico Dell'Angelo. During the week of the first Khaita supervision/exam, March 2016 at Dzamling Gar, our dear Enrico Dell'Angelo captured many unique moments of this memorable event with his camera. 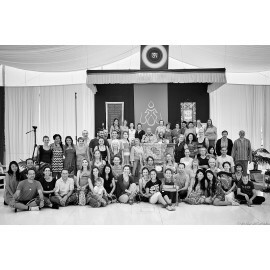 All the dancers can be seen in more than one photo, and many of the photos were taken when candidates were receiving their questions from Rinpoche. Not only candidates but many other people who were present at Dzamling Gar for this occasion also appear in some photos. It was Enrico's wish to offer these photos in exchange for donations in order to support the activities of the Shang Shung Foundation, such as Khaita Joyful Dances. It is a precious collection of beautiful memories, black and white photos, seen through the eyes of a dear friend. We invite you to download the archive with 248 high-resolution photos suitable for printing for 10€. The profit will go to the Khaita fund.